Welcome one and all to another year of MNFC! Last monday we descended to the far reaches of Streatham (which for some of us was a bit further than we remembered!) and to the new home of our beloved Susan for a night of pizza, booze and chocolates. Going against one of the underpinning slogans on the MNFC manifesto “Variety is the Spice of Fascism”, Susan revealed how she is developing a theme in her film choices, and has thus far shown films about childhood (namely the brilliant Son of Rambow and Little Miss Sunshine). This may be the teacher coming out in her yet again (yes… we know, Maths IS everywhere!) as she supports the yoofs of today and the heroes of tomorrow. But whatever the reason, there were whoops of joy from the film clubbers when her film choice was revealed as Beasts of the Southern Wild. 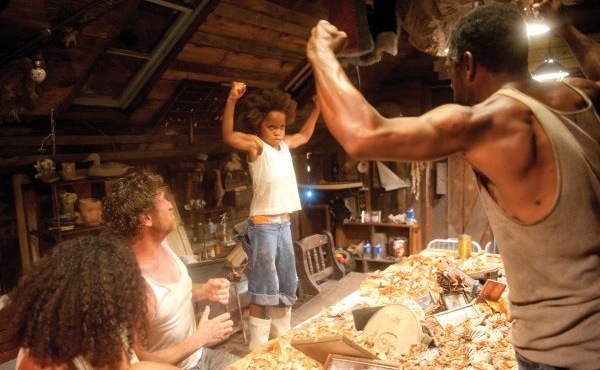 Beasts of the Southern Wild is a film about a six-year-old girl named Hushpuppy, who lives in a bayou community called The Bathtub somewhere in the American South, in an undisclosed time in the near future. Due to melting ice caps, raising sea levels and the building of a levee, the community is under threat. Although narrated by Hushpuppy, we also see The Bathtub through the eyes of her hot-tempered father, who with ailing health, prepares his daughter for survival alone in this environment which is in equal measure plentiful and inhospitable. On it’s release in 2012, the film was a critical success. Stylistically and thematically it was linked to other films such as those by Terrence Malick (Tree of Life, Badlands) and the river sequences in Apocalypse Now. The film clubbers also agreed there were parallels with Cormac McCarthy’s The Road: although in some ways a similar concept, this film showed hope where as The Road showed despair (likely down in part also to a soundtrack which kept Beasts of the Southern Wild more optimistic, endearing and fantastical). It also differed to The Road in its portrayal of a community (rather than individuals on their own) that must be fought for to survive. As such, Beasts also was able to touch on wider issues, that are very potent and relevant for today: forced migration, forced health care, disinterest in local culture… On the bus home from Susan’s I got thinking also about how in the film the building of the levee and the assistance offered by the state when the flooding began could be a metaphor to the real-world delivery of aid to developing communities. Often a man-made problem is initiated in the west, such as poverty (e.g. triggered and propagated by economic restrictions, local farming subsidy, changes to local power balances by western backing, workforce exploitation by multinational companies etc etc) and the solution to this is to provide aid in a well-meaning gift package by these same countries or organisations. But perhaps I’m over-thinking things. The director Benh Zeitlin gives an opinion on some of these issues in this interview with the BFI. Interestingly, he states that he never meant to make a political point in this film; but he seems to regard issues such as global warming with importance; and notes the effect of Hurricane Katrina and the BP Oil Spill on both the New Orleans communities and the Louisiana landscape and ecosystem. There is iconography aplenty within the film to represent much of this; thick mud everywhere replaced only by water, dead animals strewn around the embankments, constant threatening thunderclaps and rain bringing a sense of impending doom. The Bathtub itself is built from rusty old car parts and oil drums, very much scrap-heap challenge. And the film was shot on a 16mm film to produce a grainy appearance which is very effective. All this brilliantly detracts from the constraints of a relatively small budget used for the film. The beating heart of all this however is the young actress Quvenzhané Wallis, who is the youngest person to have been nominated for a best actress Oscar. Probably she only lost out to Jennifer Lawrence because no one could pronounce her name. And with the Oscars looming yet again, the world actually is turning it’s eyes to the cinematic event of the awards season, the 3rd annual FAFTAs. But first, to Comrade Sam’s house in 3 weeks. Until then, I’d like to send all my love and the best wishes of the whole MNFC crew to our beloved founder. We’re thinking of you. When it all goes quiet behind my eyes, I see everything that made me lying around in invisible pieces. When I look too hard, it goes away. And when it all goes quiet, I see they are right here. I see that I’m a little piece in a big, big universe. And that makes things right.